This documentary about Bees does a great job of going into depth about how the use of pesticides, which is killing our bees, is a symptom of a greater problem, and that greater problem is the way we till, till, till until we change the biological community of the soil--pests are overcome when you establish biological balances, as Dr. Lundgren explains, which would eliminate our need to use neonicitinoids, very toxic to bees. 13% of all our land surfaces are compromised by the use of these agents. 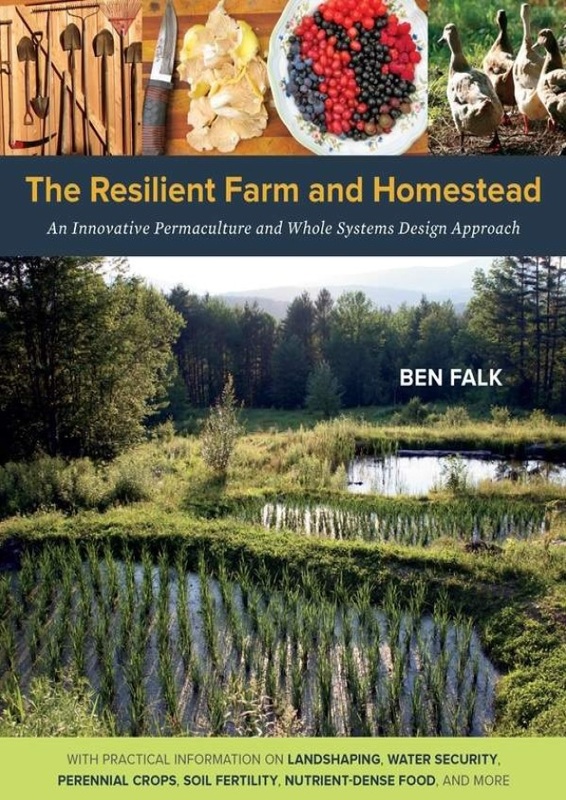 This kind of farming is regenerative, where they are rebuilding biodiversity in the soil. First step is: Stop tilling. That's excellent. I knew you could do a lot with just a half acre but what they've done with less is incredible. As they say, they don't have to commute and can never be fired. When people are throwing away land and skills that can sustain them forever to 'go to college' for a 'respectable' job they hate and pay for the privilege to live in a sewer (city) it shows they don't know who they are anymore. That's not to say that agriculture is for everybody and school benefits no one, but the denigration of 'real' skills started way back there. Denigrating farming, denigrating motherhood, denigrating racial cohesion for Whites as 'backward' when it's the opposite. In 'The Good Earth' when the dutiful Chinese wife stopped her husband from selling the land, I remember that scene, when they were starving and he was going to sell some of it. 'NO. Not the land.' Anything but losing the land. People are starting to come back to that way of thinking again. So true, Emily. The pleasure of gardening provides food for the soul as well as for the table. This article focuses primarily on Kentucky, but regulations regarding hemp have affected it all over the country. The CBD oil is a highly sought after health product, and of course hemp has many other uses, but people worry about it's future. It either has a very bright future or a complicated one. I know there are about 40 or so suppliers in North Dakota and one or two companies that extract the oil and are on the manufacturing end. It is easy to grow, potentially very profitable relative to the space it requires to grow it, requires very little of the farmer in the way of water and care as compared to other crops. Anyone getting in on it now is going to be a pioneer in what might become a giant industry in the near future. "Some of these uncertainties have been addressed by the enactment of the 2018 farm bill, which included language to remove industrial hemp from the controlled substance list, enables hemp farmers to be eligible for federal crop insurance, and allows hemp researchers to apply for competitive federal grants. Despite legislative approval and expanding product sales, regulatory risks still prevail which complicates the long-term outlook for hemp. In reality, the “economics” of hemp is complex. Economists are challenged in evaluating this crop’s economic potential given an alleged 50,000+ uses for this crop from different parts of the plant, various production methods, an unpredictable policy and regulatory environment, and at least in the short-run, limited market and farm-level data. This article will provide some general “macro” economic issues related to the crop. We will present some farm-level budget and financial analyses in next month’s issue to assist farmers in making production and investment decisions related to this crop." CBD is readily available here in the NYC area and helped me to sleep after a construction accident that laid me out last year for awhile. CBD worked better for me than the old go to melatonin which I'd use to help with the occasional bouts of insomnia that plague this old man and has the added effect of helping with the neuropathy I had in my left hand from the incident as well. Good stuff. I'd be interested in growing/distributing/whatever, $ky'$ the limit with all things connected to marijuana, hemp and it's 'medicinal' uses these days. Yes, hemp has a secondary use that is lucrative, it's the fibers. Used for all kinds of things but the fibers can be used for 'hempcrete' in construction-- that'd be valuable to an extreme. I remember getting a smoothie in TX in lieu of lunch sometimes called the 'Honey Bear' and it had honey, banana, soy milk, vanilla, and hemp seeds. I asked why hemp seeds and the worker told me 'protein!'. People waited in the sweltering heat to get the smoothies because it had waiting space outside--line wrapped around the block so I figured they were good and they were. Hemp has about 31 g of protein per 100 g of hemp, and also Vit E, magnesium, calcium, etc. Healthy fats too. I'm primarily a bee wumin but want to diversify and this is definitely interesting, gonna learn about it this summer. "The election to the board of Laura Foley, a partner in CBD company Canabaoil and Jack O’Connor of agri-tech firm BHSL came during a recent meeting of about 80 stakeholders who heard board member Kate Carmody give an update on the activities carried out by the board during the previous 12 months, and other presentations." "Attendees also heard board member Ed Hainbidge give a detailed presentation on how to apply for a license to cultivate hemp in Ireland. With many of the individuals in the room keen to grow hemp for the first time, this provided valuable insight into the process involved." Might be a good time to buy stock in this as well, though that is something I know very little about, and when it will go 'up' or 'down' and what-not is speculative and a gamble. But at some point, likely to be very valuable, stock in one or more of these companies. This older story tells more of what happened, equipment failure that was not rectified in a timely manner...looks like he could've been responsible for doing some misdeeds, but also looks like he might've been set up to fail, IDK. The latest story, as you can recognize, only told the State's side. He pleaded not guilty so it'll be interesting to see what comes out, I'll follow the case. Page generated in 0.11500 seconds.